This city Antiguo Cuscatlan, which is adjacent to San Salvador, belongs to the department of La Libertad. Cuzcatán in Nahuatl means " Place of jewelry and precious stones". 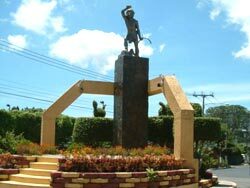 The name was changed to Cuzcatlán by Mexican indians who guided conquerors throughout the region and decades later changed it to Cuscatlan, after dropping the letter "z" for an "s". Archaeological Investigations have proven the place was once an indigenous community, due to the artifacts found when building residential areas such as Madreselva and Santa Elena (Close to where the US Embassy is). Antiguo Cuscatlan once belonged to San Salvador, but was transferred to the department of La Libertad in 1865. Two major private universities are located in Antiguo Cuscatlan: "Dr. Jose Matias Delgado" and "Jose Simeon Cañas, UCA". I was in the UCA where the Jesuit priests where assassinated in 1989, during the civil war. Also in Antiguo Cuscatlan: "El Espino" a coffee plantation area, formerly known as "the lungs of San Salvador" and the Botanical garden "Plan de la Laguna" an ecological park located inside an extinct volcano crater. One of Antiguo Cuscatlan major festivities takes place on December 12th, when Catholics commemorate the virgin of Guadalupe appearing to the indian boy Juan Diego (now Saint Juan Diego) in Mexico. The image of the virgin was originally located in Santa Tecla; since 1961 this image was taken to basilica of Guadalupe. 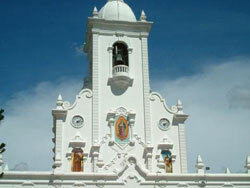 Antiguo Cuscatlan serves as main gate into San Salvador when coming from the west.